Country please select a country United States of America United Kingdom France Afghanistan Albania Algeria Argentina Australia Austria Belgium Brazil Bulgaria Canada Chile China Colombia Costa Rica Croatia Czech Republic Denmark Ecuador Egypt El Salvador Finland Germany Greece Hong Kong Hungary India Indonesia Ireland Israel Italy Japan Jordan Korea, South Lebanon Malaysia Mexico Morocco Netherlands New Zealand Norway Pakistan Peru Philippines Poland Portugal Puerto Rico Romania Russia Saudi Arabia Singapore South Africa Spain Sweden Switzerland Taiwan Thailand Turkey U.S. Minor Outlying Islands Ukraine United Arab Emirates Venezuela Yugoslavia (Former) [Other] Error message here! User name Error message here! Confirm Password Show Error message here! Clicking on the sword will take you through to the relevant classified item or dealer site. Don't miss out! - Do you want to be kept informed weekly of new aditions? Just join our weekly update list. You can also receive regular email notifcations when items match your keywords. To recieve them just register or logon at the top right of this page. South German Or Swiss Hand And A Half Sword Circa 1560. A scarce and attractive “hand and a half” sword dating to the mid 16th century. A well made example, finely balanced in hand, well constructed and in good condition. The distinctive hilt is similar to contemporary hilts of more common single handed swords known as “Saxon”, but most certainly made and used over a much wider region. Two similar hand and a half examples are displayed in the Doge’s Palace in Venice. These large swords were not just for two-handed use. They were designed to be used equally well with one hand by a trained user. In the 16th century these swords were probably not a rare site on European battlefields, carried by mercenaries and professional soldiers in armies fighting almost permanently during a time of shifting religious, political and social change. As fashions changed towards the beginning of the 17th century they went out of use and today are quite rare compared to the survival rates of two-handed swords which are of the “bearing sword” variety – large, well made, imposing and decorous, but designed mainly to be carried point up in civic procession rather than for use in combat. The hilt consists of a robust square section quillon block from which the broad arms of the cross guard are forged in flattened diamond section broadening towards the ends and terminating in shallow diamond profiles mounted with knops in the centre. A ring guard is forged from the block, and a smaller secondary ring guard sits beneath this attached to the base of two vertically aligned convex crescents of iron, which extend from the underside of the block either side of the ricasso. This structure is further strengthened on the reverse side by two crossed loops of rounded form which protrude from the block and attach to the base of the guard crescents below. A thumb ring is attached to the block above these loops. The pommel is of solid cone form with a slightly flared and narrow neck beneath. The waisted stepped grip is of wood covered with leather over a cord wrap. The broad blade is double edged with a ricasso extending some 5.5 inches (14 cm) from the hilt. A single broad central fuller extends down the centre of the blade 9.5 inches (24 cm) flanked by two shorter fullers of similar width which extend for the length of the ricasso. Beyond the central fuller the blade is of flattened lenticular section to its tip. Just beyond the end of the central fuller a stamped armourers mark is present both sides consisting of a face in a half moon facing to the left. This type of mark was often used by Solingen and Toledo trained smiths. This mark particularly resembles the Toledo mark of Espadero del Rey. The blade is most likely of Northern Italian origin manufactured by a Toledo trained smith, working in an area under Spanish control, possibly Milan, from where Spanish blades could easily access the wider European sword making markets. It is also possible that the mark is of a Spanish trained smith that went on to work in one of the non-Spanish blade-making centres such as Solingen and that the sword was made in its entirety there. This sword form was not common in the Spanish armoury. Some European sword makers are known to have trained in Toledo, for example Heinrich Col who was a German from Solingen who worked in Toledo then in Germany (Cf. Seitz I, p. 344, and II, p. 268) indicating that movement of smiths between blade and sword making centres occurred. For more information on this mark see “European Makers of Edged Weapons, Their Marks – A Handbook for Museums and Collectors”, Staffan Kinman, Norrkopings Tryckeri, 2015. Blade length 39 inches (99 cm). Length overall 47.5 inches (120.5 cm). German / Tyrolean Hand And A Half Sword Circa 1520 With Islamic / Ottoman Inscription. A German or Tyrolean “hand and a half” size fighting sword, of attractive proportions, dating to the first part of the 16th century. A worn Islamic inscription on both sides of the blade indicates that the sword was once captured by the Ottomans as a trophy, most likely in one of the many battles engaged between European and Ottoman forces, as the Empire expanded into the Balkans, Southern Europe and the Mediterranean rim in the late 15th and 16th centuries. Until the early part of the 20th century many similar trophies were stored at the Istanbul Armoury (now the Military Museum, Asker Muzesi, at Harbiye), and relocated to other locations around the city in turbulent times for Turkey at the end of the Ottoman era, often to insecure and inappropriate storage. 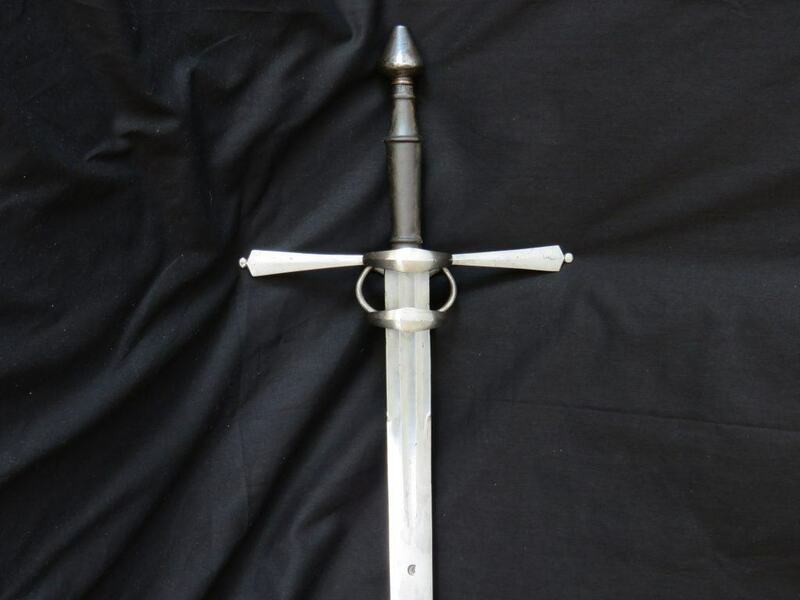 Some swords like this dispersed to European collections where they were cleaned and displayed. The story of the sword therefore not only represents the European armourer’s craft in the early 16th century, but also in different ways, the rise of the Ottoman Empire, which it was originally used to oppose, and its decline. 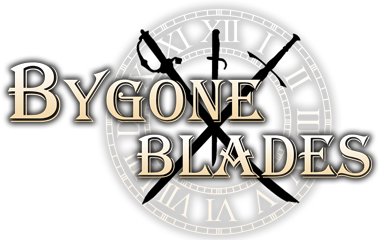 The broad double-edged blade gradually tapers towards its point. A central fuller extends from the hilt either side for 10 inches (26 cm) which is flanked by two shorter fullers 7 inches (18 cm) in length. Just after the fullers terminate the inscription is applied slightly to one side on each face and the blade is of flattened lenticular section thereafter for the rest of its length. The middle of the cross is forged as a thick, oval guard bar. The quillons are of rounded section and curve downwards to terminate in large waisted swollen knops. A sloping thumb ring is present on one side and a more imposing guard ring is fixed to the other, strengthened by secondary guard bars which join the sides of the ring with the cross bar. The outer edge of the ring is decorated with knops of similar style to the quillon terminals. The solid pommel is dome shaped on top, decorated with fern-like incised designs, cone shaped below and mounted with an integral button. The waisted stepped grip is of wood covered with leather over a cord wrap. These large swords were not just for two-handed use. They were designed to be used equally well with one hand by a trained user. In the 16th century “hand and a half” swords were probably not a rare site on European battlefields. As fashions changed towards the beginning of the 17th century they went out of use and today are quite rare compared to the survival rates of two-handed swords which are of the “bearing sword” variety – large, well made, imposing and decorous, but designed mainly to be carried point up in civic procession rather than for use in combat. Blade length 41.25 inches (105 cm). Length overall 49.5 inches (126 cm). One of the leading specialist dealers in Fine Antique Arms & Armour. Over 25 years of experience collecting and exhibiting. 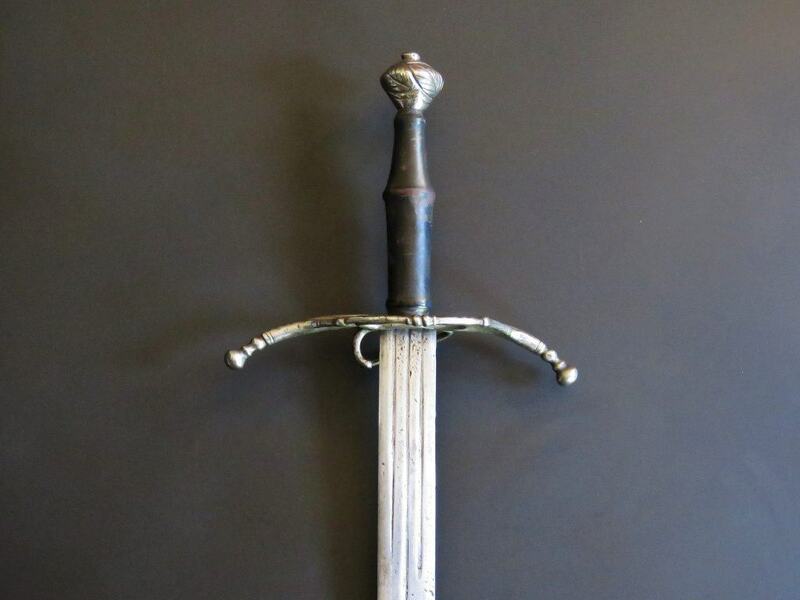 1000's of Original Old Swords for sale, Japanese, UK, USA etc. Specialist in smallswords and 18th and 19th century military swords. 1000s of Original Old Swords for sale, Japanese, UK, USA etc. © Copyright 2017 ‘oldswords.com’ | All Rights Reserved.